New Delhi: Mobile phones were seen to be the highest sold item in the just concluded festive sales online. 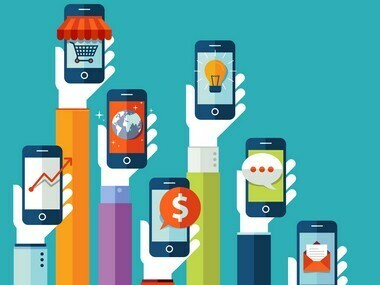 According to Criteo, a commerce marketing company, mobiles are the first contact of brand interactions. The maximum goods bought online were done through mobile phones and the trend is expected to continue this year too with data penetration, availability of affordable smartphones, easy online payments modes and easy return/exchange policies. Smartphones is no longer being used to buy only low cost products/services. The surging internet penetration, flexible and secure payments modes have influenced online shoppers to purchase jewellery, luxury goods and apparel via mobile apps. Moreover the convenience of purchasing products and easy return policies in addition with personalisation experience provided by retail and mobile apps are further stimulating the sales through apps, says Siddharth Dabhade, General Manager, Criteo India. To attract maximum traffic, each e-commerce company is offering products at throwaway prices. Thus, the attention span of online shoppers quickly shifts to other offers, without completing a transaction on a particular website. It is important for retailers to help potential customers complete their transaction by offering them relevant products of their choice, across devices, Dabhade said. 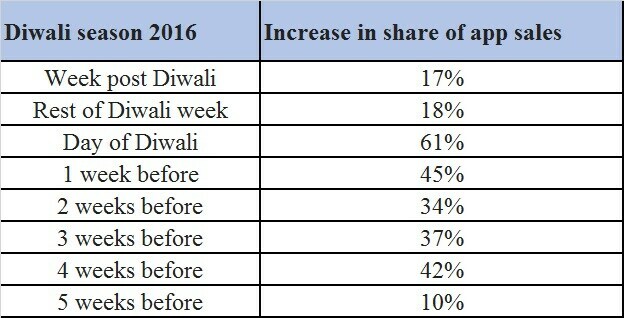 Prior to the onset of the online festive shopping season, Criteo, releases its seasonal data, anticipating shopping trends this Diwali. Based on the analysis of about 4.8 million transactions, the report has seen an upsurge of 490 percent in average visitors, leading to an increase of average sales by 140 percent, on major e-commerce websites pre-Diwali last year. The report serves as a guide for marketers to understand online shoppers and their buying behaviour. Highlighting the current trend of shopping through mobile apps, the report underlines that although sales start to pick up from August onwards, the highest sales peak between four and two weeks before Diwali, and so does website traffic. Hence, it is important for retail companies to encourage shoppers to download the retail app 1-2 months before Diwali and build a profitable pool of shoppers by driving traffic to their websites. The festive season in the last few years has seen a trend of large number of shoppers shifting from traditional modes of shopping, to online shopping. According to the report, the top performing online retail sub-verticals during Diwali are jewellery, luxury goods and apparel. Siddharth Dabhade, General Manager, Criteo India said, “With the internet penetration, and availability of smartphones at an affordable price, Indian shoppers are becoming more confident to make purchases online. They are taking a leap forward, and dismissing traditional shopping habits. As compared to last year, this festive season is expected to bring a large number of shoppers online, promising great sales results for e-commerce giants. With a rapid increase in the number of smartphones and data revolution in India, smartphones have become the first point of brand interaction for users. It is in fact now the most personalised medium to reach Indian shoppers. According to the data gathered by Criteo, during the festive season last year, up to 66 percent of increase in the share of mobile sales was seen, as compared to average weekly sales during April-May (2016). 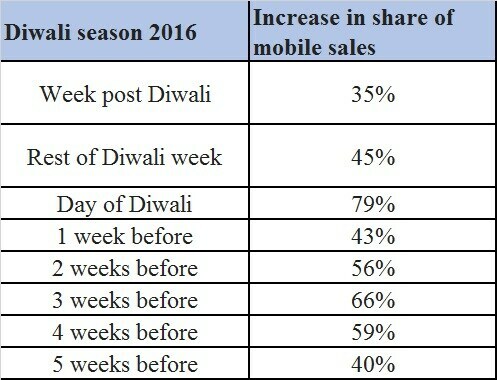 The uplift in the share of sales through mobile phones is significantly higher than usual during the weeks leading to Diwali, which was the highest at 79 percent on the day of Diwali (as per the recent report). This is also because shoppers can easily access smartphones for last-minute shopping. The in-app availability of e-commerce websites has further triggered the rise of m-commerce in India and has made it the largest mobile apps market. In 2016, Indian users downloaded about 6 billion mobile apps, up from 3.5 billion in 2015. According to Criteo’s data, during the week before Diwali (in 2016), the share of sales that occurred on apps was 45% higher than the average sales. And particularly on the day of Diwali, the uplift was seen up to 61%. Seeing an upsurge of shopping via mobile apps, it is vital for retail companies to start the in-app interface, considering major buying behaviour is shifting from desktop to mobile.